Financial transformation in just one hour a week!You can revolutionize your finances in only sixty minutes! Looking for long-term economic stability and not common quick-fix schemes? Discover the secrets that Ellie Kay used to deliver her family from $40,000 in consumer debt. Now a nationally recognized financial expert and best-selling author, Ellie shares her one-hour-a-week program that has mad… e it possible to take care of her family and do it all debt-free! 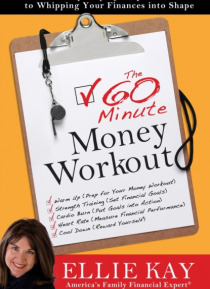 With entertaining anecdotes, easy-to-follow charts, and practical advice, The 60-Minute Money Workout is both fun and feasible. You'll be able to:> Get out of debt and save for your kids' college> Have meaningful and debt-free vacations> Pay cash for your cars> Make a difference in the world by giving generously> Find financial peace with your spouse> Be content with your current circumstances> Latch onto hope for your financial futureIn just one hour a week, you'll be financially stronger and smarter. Revolutionize your quality of life with the Workout and you'll never look back!From the Trade Paperback edition.